Barefoot trimming involves many factors that must be employed in order for it to be a successful venture. Some primary components are: environment, husbandry, hoof health and expectations. 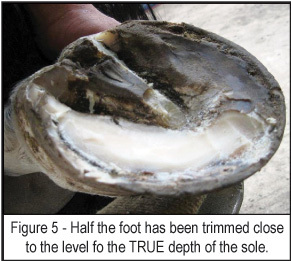 As a hoof care provider, you may only have control over 1 or possible 2 of those components. The hoof care needs and ultimately the hoof health of the horse is your primary focus in most cases. Although you may be able to offer advice to the horse owner regarding husbandry issues like feed, conditioning, environment conditions, or expectations, you really only have control over the feet. In many cases, even that bit of control may be shared with the owner or others involved in the overall care of the horse. It is for that reason that you need to have some specific goals in mind so that your contribution offers the horse the best possible chance to live a happy and sound life in managed barefoot care. The three primary goals of barefoot trimming are: Protection, Support & Balance. In all actuality, the same goals are in place in any approach to hoof care, whether it be shoeing or barefoot. However, we will mostly focus on barefoot hoof care in this article. When we talk about protection, we are basically addressing the protection of the coffin bone inside of the hoof capsule. In general, the structures that are responsible for protecting the coffin bone are the sole and the hoof wall. The sole offers protection from the bottom or ground surface. The hoof wall offers protection from the bottom by way of the ground clearance it can offer to the sole. The wall also offers protection for the coffin bone from impact to the front or sides of the foot. It is through a combination of the health of these two structures that will often times determine the capabilities of a horse to successfully be barefoot or not. From a trimming standpoint, these are also the two structures that are often addressed differently from one environment to another. Meaning, that in certain climates or regions of the world, more sole and/or wall protection is necessary than it would be in a different region. It is also the component of a protocol or set of hoof care guidelines that needs to be somewhat flexible and adaptable to a wide variety of environments. For example, the E.L.P.O. Barefoot Trimming Protocol offers a road map to get from point A to point B. However, the success or failure of implementing the guidelines is largely determined by the choices you make when it comes to exfoliating the sole and then trimming the wall with respect to that sole. Obviously you could opted to take the ultra conservative approach regardless of the environment, and never remove any sole material in the toe region and leave ¼” of wall clearance above the sole. In the majority of your cases, you would probably not have sore horses or horses that could not walk off comfortably across the gravel driveway. However, in most environments you will eventually end up with massive distortions and imbalances because neither you nor the environment is facilitating the real maintenance needs of the foot. Therefore, it is up to you as a hoof care provider to figure out where that protection equilibrium is for each horse in your care. Hopefully some of this advice will help you make those decisions. 1. First of all, you must be able to recognize what you are starting with. This means that you should always run hoof testers over the sole prior to starting your exfoliation. In doing so, you will not only get an idea of any sensitivity to sole contact that the horse may have, but you will also gain an appreciation for the density or texture of the sole material. You may run into a situation where the sole seems to be rock hard, but the slight bit of flexing of the entire sole from the pressure of the hoof tester yields a pain response. On the other hand, you could get no pain response from your hoof testers, but the sole is very soft and spongy even with the slightest amount of pressure being applied. Even within the same environments you can and will get a variety of different hoof tester results, so make this a standard part of your trimming procedure and will you have fewer problems in the long run. 2. It is important to recognize how much length of wall (beyond the level of the sole) that you have before you start trimming. In the high plains of Colorado, the ground during the majority of the year is very hard and does not yield to the foot. Therefore, if the horse has a moderate amount of room to roam, the hoof wall is often worn down to the level of the sole in the toe region. In light of that fact, most horses require very little sole exfoliation in the front half of the foot. Even the slightest amount of sole removal in feet like this can be disastrous because there is no wall available to take over the role of protection once any amount of sole is removed. The same is true in an extremely wet environment where feet can get severely flared out and the sole sinks to the same level as the wall. In these cases, if you remove the cracked and flared hoof wall, you will virtually have a negative or zero sole/wall clearance. If you then remove any sole material at that time, the horse is likely to be off, and in many cases suffer from what you’ve done. The only saving grace for horses in this situation is that the ground is often times soft, wet and non-intrusive to the foot, so they may remain comfortable enough as long as they don’t have to travel on any hard or abrasive terrain on their way to the softer ground. The point is that if you do not have any protective wall material before you begin your trim, it may limit the amount of sole material (if any) that you can safely remove, even if it is chalky material. 3. Although these terms are often used in conjunction with each other, the depth of the sole and the thickness of the sole are not the same thing. Sole thickness is the amount of live or functional sole material that is generated from the sole corium. In layman’s terms, the sole thickness is usually recognized as the amount of functional sole material beneath the coffin bone. (Figure 1 & 2) The amount of sole thickness a foot has can be measured on radiographs. However, it is not always easy to know exactly how much sole thickness exists just from looking at a give foot. A good sole thickness could be as much as ¾” (22 mm), where as poor sole thickness could be as little as ¼” (6mm). The more live sole thickness a horse has, the better chance they have of being comfortable barefoot (at least in theory). Horses with very little sole thickness will often have a tougher time going barefoot. On the other hand, the depth of sole is better described as the amount of sole buildup above the level of the true frog apex. (Figure 3 & 4) The buildup of material can be live and functional, but in many cases it represents an excess of exfoliating sole tissue that can be removed. 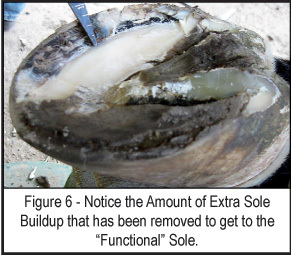 (Figure 5 & 6) Keep in mind that depending on the situation, a certain amount of extra sole buildup (and even some retained sole) can still be serving a functional purpose. If, for example, a horse is missing good supportive wall in the toe-quarter region, the retained sole can offer some necessary protection for a while. 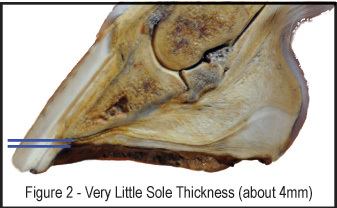 However, in most cases, too much depth of sole or a retained sole can contribute to pathologies like negative plane PIII angles, or the proliferation of hoof capsule distortions that increase leverage on the DIP joint. Therefore, learning to recognize how much depth of sole you have is necessary in order to make appropriate decisions about the protective needs of the foot. 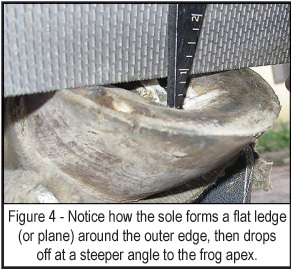 As you know, locating the true frog apex is the key to determining the depth of sole. 4. When it comes time to actually start exfoliating the sole and trimming the wall, you have to make a decision based upon all the observations and information you’ve gathering in the first 3 steps. Providing protection to the coffin bone is certainly a balancing act. If you take too much from one area, you have to make sure you have (or leave) enough from the other area to keep the horse happy. Example 1: Let’s say you have a horse with lots of extra sole material (meaning a lot of depth to the frog). The extra sole material is currently allowing the wall to grow long and forward, which is leading to extra leverage on the DIP joint. You know that the toe distortion needs to be dealt with, however if you remove all that extra sole material and expose some live material that is not conditioned, the horse is likely to be sore. In this situation, the sole buildup is contributing to the distortion of the toe, so it needs to be removed. You are fortunate to have plenty of hoof wall length to work with. Most horses you trim get by just fine with having 1/16” of wall above the sole, and many have the wall and sole equal in height. However if you remove the necessary sole material to help this particular horse, and then trim the wall down to 1/16” above the level of the sole, the horse will most likely be uncomfortable. Fortunately, you have an opportunity with the additional wall length to leave EXTRA height above the level of the sole to balance out the protection that you have already taken away. In most cases 1/8” or slightly more is all the wall height that is needed to keep the horse comfortable. If you leave ¼” or more of wall height, you will probably have trouble with it breaking off and possibly causing a secondary problem, so be conservative, but not too conservative. Example 2: Let’s say you have a horse that has the outer hoof wall chipped and rolled away around the front half of the foot. The inner part of the wall is at the level of the sole, but the outer part of the wall is ¼” below the level of the sole (similar to what is known as a mustang roll). If this horse happens to live in Colorado and is fairly sound when you start, then you probably should not touch the sole with a knife or even a rasp, especially if there is no real depth of sole. Removing the thin, hard, crust of sole material in these cases will often times spell disaster. The “give-and-take” in this situation is that there is no wall, so you better leave all the sole. Keep in mind however, that if this horse lived in a soft, grassy field in Louisiana, then the protection requirements would probably be different. It all comes down to knowing what protection that horse needs for his environment at that given point in time. Unfortunately, there are no hard and fast guidelines that are full proof for every horse in every environment throughout every day of the year. That is where experience comes into play and your experiences with the horses in your area will need to be your guide for filling in the gaps of any protocol you follow. I will spend more time talking about this goal in a later article and also on the E.L.P.O. website. As always, it is important to evaluate the structures that are involved in providing support to the barefoot horse. Once again, the coffin bone (and therefore the bone column) is the structure we are trying to offer support to. The components of the foot that facilitate this support are: the frog, bars, sole, and hoof wall. 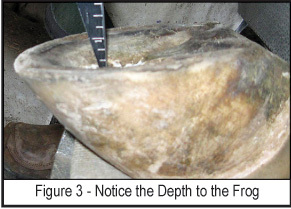 The hoof wall holds the coffin bone in place through its attachment via the lamina. 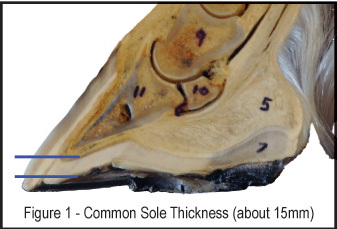 The sole (primarily the pillars & sole callus) also help hold the coffin bone up inside the hoof capsule. The formation of the bars help to support and hold the lateral cartilages up, which in turn support the back of the coffin bone. The frog acts as a primary support structure by influencing the soft tissue in the back of the foot (like the digital cushion) to hold the Navicular bone in place and lift the back of the coffin bone through the lateral cartilage matrix. Like the goal of Protection, there is a balance between all the primary support structures of the foot. If the hoof wall fails (like an underrun heel for example), and the bars fail (by curling and laying over), then the frog has to pick up the slack if the foot is going to remain functional. Unfortunately, the frog isn’t always capable of facilitating all the support needs in the back of the foot, so pathology often follows. For example, if the structures inside the foot that are influenced by the frog (like the digital cushion and lateral cartilages) are weak due to lack of development, then negative plane distal phalanx syndrome is likely to occur. Likewise, in cases of laminitis, when the lamina attachment becomes compromised and the support offered by the hoof wall fails, the bars often respond by growing strong, upright and continue all the way around the frog apex. This forms a kind of inner hoof wall to offer support to the coffin bone. It is apparent that the support structures of the foot work together as best as they can to get the job done. However, when 1 or more fail, the other structures have to take over and unfortunately, in time, they too begin to fail. From a barefoot management standpoint, when all the support structures are healthy and functioning properly, the likelihood of the horse being comfortable and striving in a barefoot condition is much more likely. In many cases where most of the support structures are failing or have failed in shod horses, just removing the shoes will usually help to restore some function to many of the support structures, especially the frog. Do keep in mind though that the quality and function of the support structures are extremely important for good hoof health, regardless of whether the foot is shod or barefoot. If hoof health is suffering, then whatever means that are necessary to help restore function to the foot should be employed. Many times, a good shoeing program that jump-starts the restoration process is often helpful for yielding the best barefoot management results in the long run. Again, I will expand upon this topic more in a later article. From an “importance” standpoint, the goals for balance are appropriately placed in the 3rd position when we talk about barefoot horses. The fact is that minor imbalances in barefoot horses are not as detrimental to the foot as poor protection and support. If a horse gets even a moderate amount of exercise on medium to hard terrain, they have the ability to fine tune the balance of their foot. When we talk about balance, we are really talking about equilibrium to the coffin joint (and joints above) both statically and dynamically (meaning at rest and in motion). As we look at the majority of improvements made in the barefoot care of horses over the last 15 years, the biggest improvement in terms of balance is the reduction of leverage. Leverage effects the foot from both a dorsal/palmar (front to back) and a medial/lateral (side to side) standpoint. By simply dividing the ground surface mass in equal proportions around the center of articulation of the DIP joint (basically the widest part of the foot), you will minimize the majority of excessive leverage forces on the internal structures of the foot. At the same time, if you prepare the hoof wall at an equal height from the functional sole on both sides of the foot, you will effectively equalize the balance of the coffin joint from side to side (since the sole is uniform in thickness on each side of the coffin bone). The specifics in how you get this done are covered in the Hoof Trimming Protocol. However, if you follow the guidelines for eliminating distortions through heel preparation and toe preparation, balance is easily accomplished. Again, if you are off slightly in a barefoot horse, the ramifications are not as detrimental as they would be if shoes where being applied. Once a shoe is applied to an unbalanced foot, the horse is stuck with that imbalance until the next shoeing period. With a barefoot horse, a simple 20 minute walk on a blacktop or concrete driveway a few days a week will likely eliminate most minor balance issues. However, major imbalances need to be address regardless if the horse is shod or barefoot. To sum up, the entire package (Protection, Support & Balance) always needs to be employed in order to have a shot at achieving SUCCESS with barefoot horses! There are too many other factors that are out of your control which can impact the results you get from trying to provide a managed barefoot lifestyle for the horses you care for. Good luck!